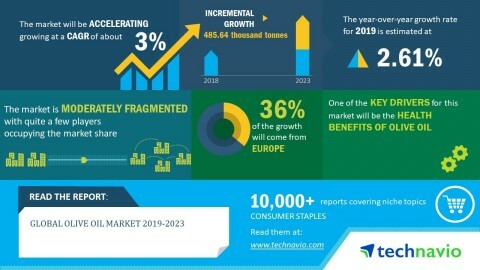 LONDON--(BUSINESS WIRE)--The global olive oil market is expected to post a CAGR of over 3% during the period 2019-2023, according to the latest market research report by Technavio. A key factor driving the growth of the market is the health benefits of olive oil. One of the primary reasons behind the growing demand and consumption of olive oil is the associated health benefits. Olive oil forms a unique and tasty alternative to conventional edible oils. Besides, its gluten-free nature is an additional value-added advantage over the other cooking oils. Therefore, with such benefits, the market is expected to showcase a positive outlook during the forecast period. As per Technavio, the expanding production areas will have a positive impact on the market and contribute to its growth significantly over the forecast period. This global olive oil market 2019-2023 research report also analyzes other important trends and market drivers that will affect market growth over 2019-2023. Nearly 90% of the world's production of olives takes place in the Mediterranean region. Previously, manufacturers of the global olive oil market had set up the majority of their production and processing facilities in the areas of Andalusia in Spain and Italy. In recent years, the leading global manufacturers of olive oil have moved down in the Southern Hemisphere and have been exploring opportunities to set up their manufacturing bases in Northern regions of Morocco, Tunisia, Algeria, and Southern regions of Portugal. Also, Peloponnese, Crete, and the Aegean Islands in Greece have been the areas of interest for cultivars and farmers of olive leaves. The production areas of olives have witnessed an increase from countries such as India, Australia, the US, Egypt, Turkey, and Argentina. “Apart from expanding production areas, the global olive oil market is being invigorated by the increasing number of new and innovative product launches. The rise in demand for olive oil products in various countries has been attributed to the product innovation in the extra virgin olive oil category, where vendors have continually involved themselves in launching new, refined, and innovative products to attract customers,” says a senior analyst at Technavio. This market research report segments the global olive oil market by application (culinary usage and other purpose) and geographical regions (Europe, MEA, North America, APAC, South America). Geographically, the European region led the market in 2018 with a market share of over 55%, followed by MEA, North America, APAC, and South America respectively. However, during the forecast period, the APAC region is expected to register the highest incremental growth followed by North America. The global olive oil market is expected to post a CAGR of over 3% during 2019-2023, according to the latest market research report by Technavio.